A Custom Printed Name Tag, Name badge, personalization and logo included. Magnetic. 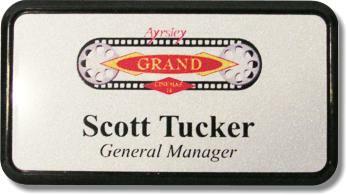 A Custom Printed Name Tag, Name badge (personalization included) Magnetic avail. Tag Color: WhiteBrass "Metallic Look"Light TanOtherSilver "Metallic Look"
Custom Printed Name Tags. Email Proof Provided! Custom logos & personalization. Each tag is unique. This name tag is to provide you with a professional appearance. Allows customers to remember names & creates a comfortable setting, improving customer relations & sales. LOGO ONLY PRICE IS DISCOUNTED See Custom Printed Name Tags ( Name Tag Printed With Your Logo) NO SETUP COST! Magnetic option available.